All health sector workers – doctors, nurses, midwives and other paramedics – share the responsibility for delivering good health services in government hospitals. Duties and roles of these professionals are intertwined. Health workers who are discharging duties in health facilities are the products of years of specialized training. Un-interrupted delivery of care is inbuilt in their roles of responsibilities, which they have undertaken to perform. 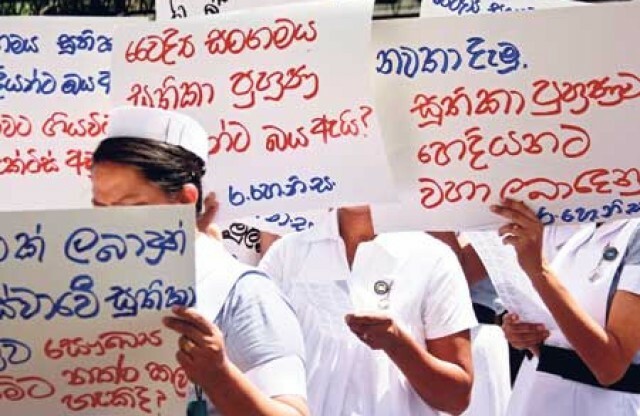 But more recently, this ‘healthy collaboration’ has come under increasing stress in Sri Lanka, with conflicts between the different actors crippling some critical aspects of patient care. Sri Lanka’s public health sector, which is focused more on free of charge and pro-poor delivery of care for patients, has been constrained by a stagnation of government expenditure on health between 1.7 and 2.0% of GDP in recent years. This has severely affected health sector development programmes, including improvements to human resources, infrastructure, medicine and bio-medical technology. 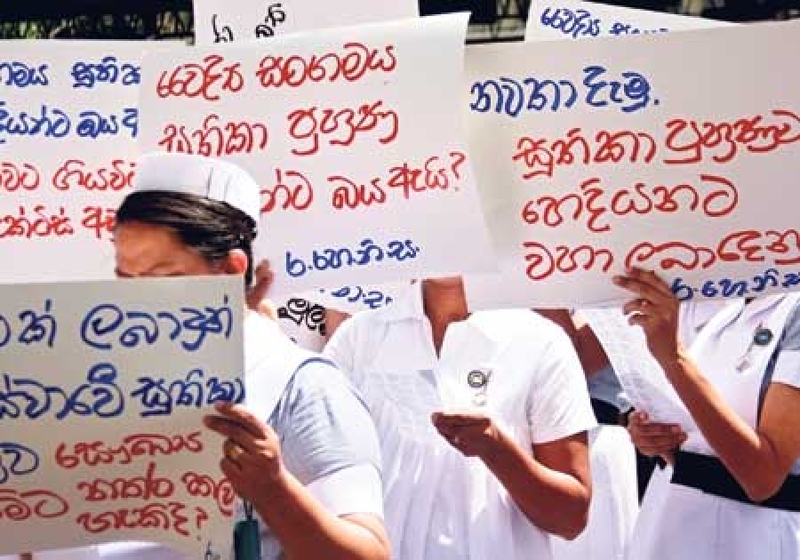 For instance, on the human resource side, Sri Lanka’s public hospitals are experiencing a severe shortage of trained nurses, and a significant percentage of nursing posts remain unfilled. These hospitals are also faced with an inadequate number of specialists, where the demand for specialty health services far exceeds the supply. Currently, the functions of government hospitals are already affected by new technologies introduced in private hospitals. These can only be used properly by specially trained physicians. Thus, more public sector specialists are now drawn to practice in private hospitals and they spend less time in public hospitals. This situation further exacerbates the shortage of specialty services. As a result the doctors and nurses in government hospitals are burdened with a heavy workload, creating a confusing and unmanageable situation in the respective roles that they are assigned to. This affects the working relationship among themselves. This has lead to an agitation to redefine their respective roles of some of the health workforce, undermining their responsibilities of caring for patients’ well being. The on-going tussle between doctors, nurses and midwives is a result of this difficult situation, which has led to midwives keeping away from their normal schedule of duties (ward preparation activities of the pregnant mothers prior to transferring them into labour rooms). This has caused critical difficulties for many pregnant mothers who are warded for delivery of their babies. The lives of expectant mothers in the maternity wards throughout the country were in jeopardy as the midwives had refused to carry out the preparation work for them and even resulted in the death of one mother and the death of an infant. Midwives have threatened to keep away from deliveries in maternity hospitals and any work related to maternity clinics across the country as a sign of protest against nurses being given midwifery training. On the other hand, the nurses group complains that trainee nurses at the Nurses Training School and the Mental Hospitals have been deprived of midwifery training. Meanwhile, the doctors stress that they refuse to work in labour rooms with un trained nurses. According to the Medical Ordinance, only a doctor accompanied by a midwife could attend the labour room. The nurses agitate that the Medical Ordinance should be amended to facilitate midwifery-trained nurses to attend labour rooms. Over this issue, an island-wide work stoppage has been initiated by the midwives placing the lives of thousands of pregnant mothers in great danger while the health policy makers maintain a somber attitude on the whole episode. The latest development in this regard is that the nurses have given an ultimatum that they will resort to trade union action if the issue is not resolved quickly. In this scenario, midwives have resorted to the ultimate sanction available by taking industrial action to protect their position. From an ethical point of view, such action by medical professionals cannot be justified because they have a direct impact on the lives of the very patients they are bound to look after. Codes of ethics have been a long-standing element in the professional control of the medical professionals and indicate a commitment to act with integrity in extreme circumstances. Global best practices show that medical staff, acting together in the best tradition of trade unionism, remains a powerful and influential force through which a great deal could be achieved by inflicting minimum harm on the recipients who are depending on their services. When patients seek medical care they are not entering an ordinary social relationship; they often feel vulnerable but need and are ready to expose and share intimate and important aspects of their lives with the caregivers. In the labour room, complex cases require evaluating treatment options, formulating recommendations, and articulating the benefits and risks to patients. This requires teamwork among physicians, nurses, midwives and non-clinicians, including physical therapists. It appears that in Sri Lanka there is a policy vacuum related to the respective roles of the doctors, nurses, and other healthcare workers in government hospitals. The ongoing tussle between doctors and nurses is a culmination of this. To overcome it there is a need to urgently review the most important factors affecting the employability of medical staff, in order of importance. For instance, workload, staffing, time with patients, flexible scheduling, respect from medical administration, promotion and scholarship opportunities, etc. It is reasonable to assume that in government hospitals the dissatisfaction among the medical staff with regard to their working environment has a strong impact, together with workload and pay. Under these circumstances, there is a need for strategic initiatives to evolve, adapt and innovate in order to continue to provide effective patient care amidst ever increasing demand, emerging technologies, and limited resources. This could be achieved only through committed cooperation among the healthcare workforce and health administrators. As an innovative model, a Voluntary Bonding Scheme and demonstrations of new workforce roles could be helpful in overcoming the recurring conflicts in the health sector. Furthermore, a multi-disciplinary team could work to break down professional barriers among physicians, nurses, and midwives and facilitate better collaboration across the full spectrum of care, so that patients get the best from health service delivery. Food Additives – Are They Safe? Thank you for publishing a timely article. Your article is very readable and you have real talent of story telling. I don’t know about other hospitals in the country but I can say that the situation in Teaching Hospital of Kurunegala is very different to that of your article. May be it is an exception which you might even mention in your future articles. 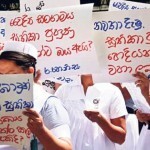 Here in Kurunegala, midwives are asking for the hospital management to take over their supervision and control. They refused to report to Matron office and insist the hospital management to have a separate register for reporting to duty. You are aware that Midwives and nurses are in the same salary category of government salary structure. Therefore they demand that nurses should not meddle with their supervision or duty allocations. They have a genuine demand. Even minor staff have their own supervision through overseers who are under the director! Matrons who are controlling the nurses do not permit the midwives to report to duty and work there. Therefore it is not that these midwives are not working but they are not permitted to work. The intention of nurses seeking midwifery training is clearly to get into the management. So far there have not been many incidents of maternal deaths during nursing trade union actions because midwives were legally there. So why would one put mothers at greater risks by handing over these duties to nurses? I hope you would contact the director of this hospital and do the justice and balance to your article by giving the other side of the story as well. Tank you very much for concerning about all the members of healthcare system.All members are essential to keep a good service and each has different contribution to it. Most of the time when a strike is going on media comes and reports superficially and the people come to report do not have correct view about what to report so public get different image about the real problem. Medical officers in Sri Lanka are so much afraid about nursing profession. They do not like to see the development of our profession. They try to create the small problem between nurses and Midwives a big one and get the advantage from it, that is the hidden truth. please be kind enough to refer about the Nursing profession in other countries and help to develop our profession to international level and give our innocent patients the grate benefit of it.